Difference between get and load method in Hibernate is a one of the most popular question asked in Hibernate and spring interviews. Hibernate Session class provides two method to access object e.g. session.get() and session.load() both looked quite similar to each other but there are subtle difference between load and get method which can affect performance of application. Main difference between get() vs load method is that get() involves database hit if object doesn't exists in Session Cache and returns a fully initialized object which may involve several database call while load method can return proxy in place and only initialize the object or hit the database if any method other than getId() is called on persistent or entity object. This lazy initialization can save couple of database round-trip which result in better performance. By the way there are many articles on interview questions in Java, you can use search button on top left to find them. Some of them like 20 design pattern interview questions and 10 Singleton pattern questions are my favorites, you may also like. Coming back to article, you can find more difference between load and get in rest of this article in point format but this is the one which really makes difference while comparing both of them. If you look at how get and load gets called its pretty identical. Here are few differences between get and load method in Hibernate. Apart from performance this is another difference between get and load which is worth remembering. get method of Hibernate Session class returns null if object is not found in cache as well as on database while load() method throws ObjectNotFoundException if object is not found on cache as well as on database but never return null. Get method always hit database while load() method may not always hit the database, depending upon which method is called. Get method never returns a proxy, it either returns null or fully initialized Object, while load() method may return proxy, which is the object with ID but without initializing other properties, which is lazily initialized. If you are just using returned object for creating relationship and only need Id then load() is the way to go. By far most important difference between get and load in my opinion. get method will return a completely initialized object if Object is not on the cache but exists on Database, which may involve multiple round-trips to database based upon object relational mappings while load() method of Hibernate can return a proxy which can be initialized on demand (lazy initialization) when a non identifier method is accessed. Due to above reason use of load method will result in slightly better performance, but there is a caveat that proxy object will throw ObjectNotFoundException later if corresponding row doesn’t exists in database, instead of failing immediately so not a fail fast behavior. 5. load method exists prior to get method which is added on user request. So far we have discussed how get and load are different to each other and how they can affect performance of your web application, after having this information in our kitty we can see some best practices to get most of load and get together. This section suggest some scenario which help you when to use get and load in Hibernate. 1. Use get method to determine if an instance exists or not because it can return null if instance doesn’t exists in cache and database and use load method to retrieve instance only if you think that instance should exists and non availability is an error condition. 2. As stated in difference number 2 between get and load in Hibernate. get() method could suffer performance penalty if only identifier method like getId() is accessed. So consider using load method if your code doesn't access any method other than identifier or you are OK with lazy initialization of object, if persistent object is not in Session Cache because load() can return proxy. If you look at below code , there is not much difference on calling get() and load() method, though both are overloaded now and can accept few more parameters but the primary methods looks exactly identical. It’s there behavior which makes them different. That’s all on difference between get and load in Hibernate. 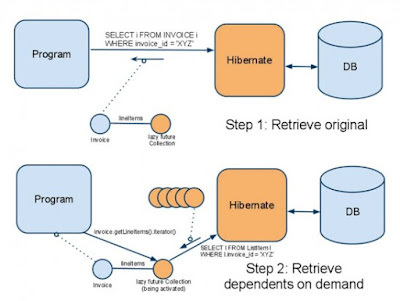 No doubt Hibernate is a great tool for Object relational mapping but knowing this subtle differences can greatly help to improver performance of your J2EE application, apart from practical reason get vs load method is also frequently asked questions in Hibernate interview, so familiarity with differences between load and get certainly helps. Thanks for reading this article, if you like this article and interview question then please share with your friends and colleagues. If you have any question or feedback then please drop a comment. Actually , get() does not always hit database , and it can return a proxy . In that case if i get proxy object from session when i use get() and if i call get properties of my object will it hit DB? when we use load proxy object will hit DB when we call getter properties of my obj. check above line in option 4. Performance. OR I think it should be instead of failing immediately so its a "fail fast" behavior. get() method never returns a proxy. As i believe it will hit database if we try to access any of its object? ?